Bison Transport Inc. has acquired Amherst, Wis.-based H.O. Wolding Inc., marking a further expansion by the Winnipeg, Manitoba-based company into the United States. Terms were not disclosed. Bison Transport President Rob Penner told Transport Topics, noting that the deal gives the company a chance to add scale and provide wider services to customers. 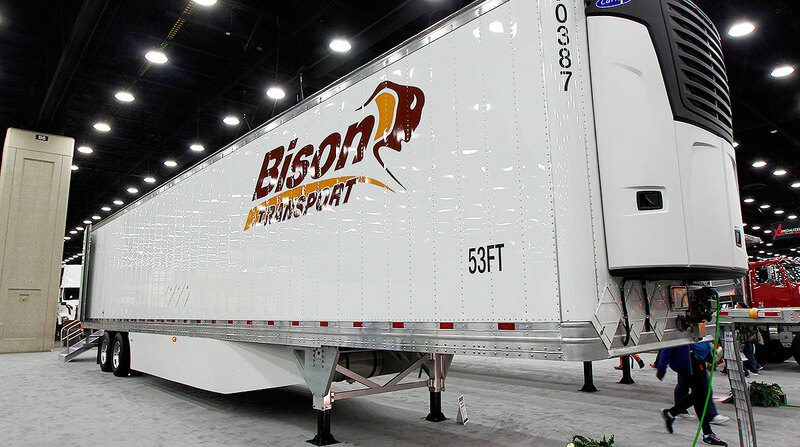 The acquisition is the latest in a string of purchases for Bison Transport and its subsidiaries, including Britton Transport, a cross-border transport and logistics operator in Grand Forks, N.D. In January, Britton bought the assets of two Iowa-based companies: Ace Logistics, a transportation logistics provider specializing in refrigerated freight, and C&C Realty, a warehousing facility offering dry, cool and frozen warehousing and cross-docking. H.O. Wolding, a 320-truck dry van fleet, operates in the Midwest, Northeast and Southeast regions of the United States. Bison Transport, founded in 1969, ranks No. 65 on the Transport Topics Top 100 list of the largest for-hire carriers in North America. The Bison deal comes at a time when Canadian trucking companies are eyeing the U.S. market in the wake of two consecutive years of strong freight movement, said Evan Armstrong, president of Armstrong and Associates Inc. of Milwaukee. A favorable lending market and a generation of company owners looking to retire make these U.S. companies even more attractive, even though there are more potential buyers than sellers, he added. “There’s still a lot of money out there looking for too few deals,” Armstrong said. That said, sellers may be motivated by the sentiment that 2019 may not be as lucrative a year for trucking firms as 2018 was, Armstrong added. Penner noted that H.O. Wolding’s owners were nearing retirement and the business was in good shape, with healthy financial statements and a good retention record with drivers. Penner said the deal gives Bison the chance to expand in busy and lucrative U.S. states, including the dairy market in Wisconsin. He noted that Bison and Britton generally specialize in retail food, furniture and beverages. About 25% of Bison’s freight is industrial, he noted, adding that the company specializes in cross-border transportation. The company has about 2,200 trucks; before the acquisition, about 150 of them were U.S.-based, Penner added. An H.O. Wolding truck on the highway by John Sommers II for Transport Topics. Marc Wolding will remain as president of H.O. Wolding. The company was founded in 1935 by Herbert Wolding as a one-man milk route, according to a company news release. Separately, another Canadian company recently stretched into the U.S.
Day & Ross Transportation Group, based in Hartland, New Brunswick, announced April 1 that it acquired A&S Kinard and Buckler Transport — both based in Pennsylvania — from Indianapolis-based Celadon Group Inc. for $139.5 million. Celadon said in a statement that the sale was part of its ongoing effort to reduce debt and streamline operations. Day & Ross said the U.S. companies provide logistics, flatbed, warehousing and specialized services. Day & Ross noted that the acquisition expands its trucking footprint in the U.S., building on a 2017 acquisition of REI Logistics & Korten Quality Systems Ltd. in Michigan. Day & Ross ranks No. 45 on the for-hire TT100.